Today’s plugin for review is the Drag and Drop Marker Question Type. On Feb 13th, 2012 the Open University released to the community ten new question types for the Moodle quiz. These are question types that they had developed when they were moving to Moodle 2. It was work that they had designed in-house (mainly Phil Butcher) and contracted the coding out to an independent developer Jamie Pratt. Tim Hunt did the release post about them which briefly explained each one. They sound great. I will get around to reviewing all of the question types over time, but for this post I am reviewing one – Drag and Drop Marker. 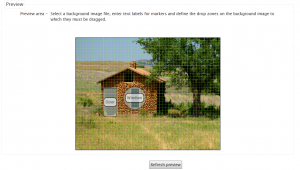 This question type enables the student to answer the question by placing a marker or multiple markers onto the image that the question is using. Yes, it is really just that simple. Is it simple to install? There is a zip available in the official Moodle plugins database. However, one of the things you find out on the detailed download page is that this question type, being a more complex one has two dependencies. You need to install two of the other simple question types to be able to activate this one. They are Drag and Drop onto Image and Select missing words. So I downloaded all three and unzipped them. I then uploaded the contents of the all three zips to the moodle/question/type folder. Logging into the Moodle 2 site as admin, I was prompted to upgrade to install the three plugins, which reported a success with no reported errors. There are no global settings for any of the question types, so once installed it was ready to try out. Is there documentation for it? The README text file with the zip has clear instructions on how to download from git should you need to. It also explains how to install for either Moodle 2.2 or Moodle 2.1. The clear GIT instructions will certainly help those who are not familiar with GIT and yet want to start using it to include plugins. The plugin entry also has this same information on the download page. The OU have their own documentation page up on their question types (this is delivered in Moodle). The space has videos about the question types, and a nice pdf of it as well. There is also comprehensive instructions (aimed at their tutors) about how to use them. This is under How to create an iCMA in Moodle. With so much documentation there, it may be useful to add in stub entries to the Moodle docs which provide the direct link back to the centralised documentation pages – on http://docs.moodle.org/22/en/question/type/ddmarker for example. Jamie also has a site set up with example quiz so people can try them out. Is it easy for the teacher/admin to use? So to test the question type, I went into a course and created a quiz and added a question of this new type. I went with all the default settings for the quiz. When adding a question, I saw that the new question types were there : Drag and drop Markers, Drag and drop onto image and Select missing words. So I selected the Drag and drop markers and clicked next. Then you were faced with the preview section, which was very simple to use. I then had to define the drop zones areas which for the first one was not something I was used to but once I got the pixel count it was fine. I then added the Markers (names for the zones which will be used as labels for dragging onto the image by the student) and selected them in the drop down for the drop zones. It may seem complicated at first but it was actually very simple – the only hard parts is the coordinates which with the auto-preview of the locations, it is very easy. The one thing I would add here is a help icon for the locations to help with pixel examples. So once all that was done, how does the question look? Is it easy for the learner/student to use? For a student answering the question is really quite simple too. The question displays an image with the pre-defined markers below the image. The student then has to drag them to the areas of the image they think they apply to. Does it do what it promises? Yes. This is a really useful question type and a great piece of work from the Open University, I look forwarding to reviewing the other ones. As this question type used aspects of the other two that was required to be installed before it would work we can get a hint of how they will work. I will not try to produce a list of examples where I see this type being used, as there are just so many in a wide range of disciplines. But one area I do see this being helpful is in geography naming countries or states, or rivers, mountains, streets … I better stop now before I can’t stop. I certainly recommend you try this out as a nice extra after the default question types in Moodle 2. These reviews check out the plugin for usability not for security. If you are considering installing any module on your site you should also check that is secure and does not impact the server performance. This work by Gavin Henrick is licensed under a Creative Commons Attribution-ShareAlike 3.0 Unported License. Thanks for taking a look at our new question type Gavin. Glad you seemed to like what you found! Very useful review and the plugin looks great. Going to test it out on our Moodle install for a geography, name labelling exercise. Does the plugin rely on Java? There was a similar question type for Moodle 1.9 that relied on Java and was therefore not usable on iPads for students taking quizzes. The question type does not use Java. Where have we got to with iPads, Android etc.? Well we got very close in the summer (2012). We had the various drag and drop questions working on iPad, iPhone, Android phone, Android tablet with old browser. But it failed on the latest Android tablet. So we haven’t released it yet. It remains on our active list.